The indie action thriller, from high-octane director and regular Willis collaborator Brian A. Miller, sees the ‘Die Hard’ star playing a man trying to piece together his missing memory during a bank heist gone wrong. 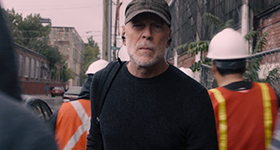 In a deal that shows there’s still an international market for old-fashioned action, distributor Tiberius has picked up 10 Minutes Gone, Bruce Willis’ latest indie action thriller, for the German market. The crime drama, from high-octane director and regular Willis collaborator Brian A. Miller (Officer Down, The Prince), sees the Die Hard star playing a man trying to piece together a missing 10 minutes lost from his memory during a bank heist gone wrong in order to find out who sabotaged him. Michael Chiklis and Meadow Williams co-star in the feature from EFO Films and MoviePass. Tiberius also snatched up German rights to the action thriller Last Rampage, starring Robert Patrick as real-life convicted murderer Gary Tison, who staged a bloody escape from Arizona State Prison in 1978. Heather Graham co-stars in the film from Halloween 4 director Dwight H. Little. Tiberius made it an AFM action three-peat with the pickup of T-34, a Russian war epic from director Aleksey Sidorov that follows a group of Russian soldiers during World War II who escape from German captivity in a wreck of tank. This story first appeared in The Hollywood Reporter’s Nov. 3 daily issue at the American Film Market. This entry was posted by Courtney on Sunday, November 4th, 2018 at 8:29 PM. It is filed under 10 Minutes Gone, Articles. You can follow any responses to this entry through the Comments Feed.